· diverse coverage of the Francophone world that includes an outstanding video program featuring bloggers and cultural footage from eight different Francophone regions. 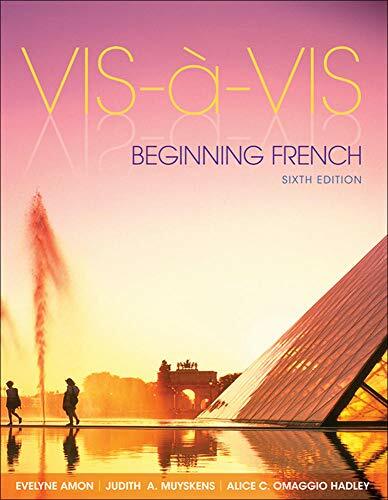 These features support the core goals of the introductory French course―communicative and cultural competence―and lay the groundwork for student success. Evelyne Amon studied at the Universitï¿ de Paris-Sorbonne. She holds a DEA in modern literature, a Diplï¿me de didactique des langues in French as a second language, and a CAPES in modern literature. She has taught French language and literature at the secondary and college levels, and for many years has led a training seminar in Switzerland for professors on advances in methodology and pedagogy. Lately, she has conducted several training sessions in teaching French as a second language for teachers at the French Institute Alliance Franï¿aise (FIAF) in New York. As an author, she has written many reference volumes, textbooks, and academic studies for French publishers such as Larousse, Hatier, Magnard, and Bordas, and she is currently working on a project for Hachette. She is the author of the McGraw-Hill French reader Cest la vie! and has written for successive editions of Vis-ï¿-vis. She lives in Paris and New York.